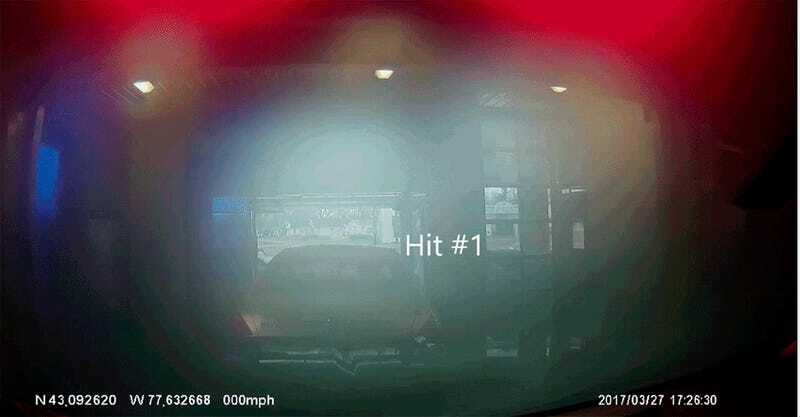 After you watch this dash cam horrorshow from inside an automated car wash, you will find a new appreciation for a bucket of water and a sponge. Reader Nick sent us this video taken from aboard his own 2014 Chevrolet Silverado. The truck was damaged in a weird pile-up inside this New York automated car wash thanks to that white Nissan Maxima, which was having some kind of mechanical trouble and stalled out at the entrance but was still allowed inside. It looks like the Maxima couldn’t drive forward at the end of the wash, when the vehicles behind it were still on their track. This, despite Nick saying he was laying on his horn the entire time, trying to get the attention of car wash employees. And inexplicably, the Maxima driver actually tries to get out of her car with all the cars piling up behind her, which of course ends with Nick’s truck hitting her bumper—and a car behind him plowing into his trailer hitch. Nick said the damage to his truck wasn’t too too bad, not as bad as what was done to the Maxima. He said he’s since filed a police report and that officers said the car wash was to blame, and he may pursue some legal action. So who’s at fault here? 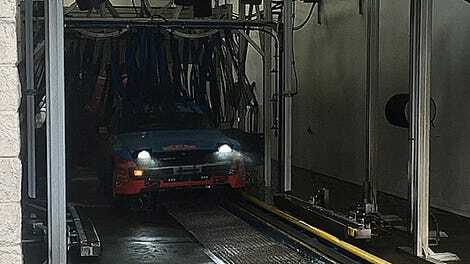 Well, besides the Maxima owner, who is clearly clueless—why would you enter a car wash after your car stalled out? Don’t you have bigger problems than dirt?—I’m laying this one at the feet of the car wash, which never should have allowed a stalled vehicle inside. Like I said, stick to the bucket. Correction: I misunderstood Nick and said the Maxima driver took off. She did not, it was the driver behind him. The post has been updated and we regret the error.